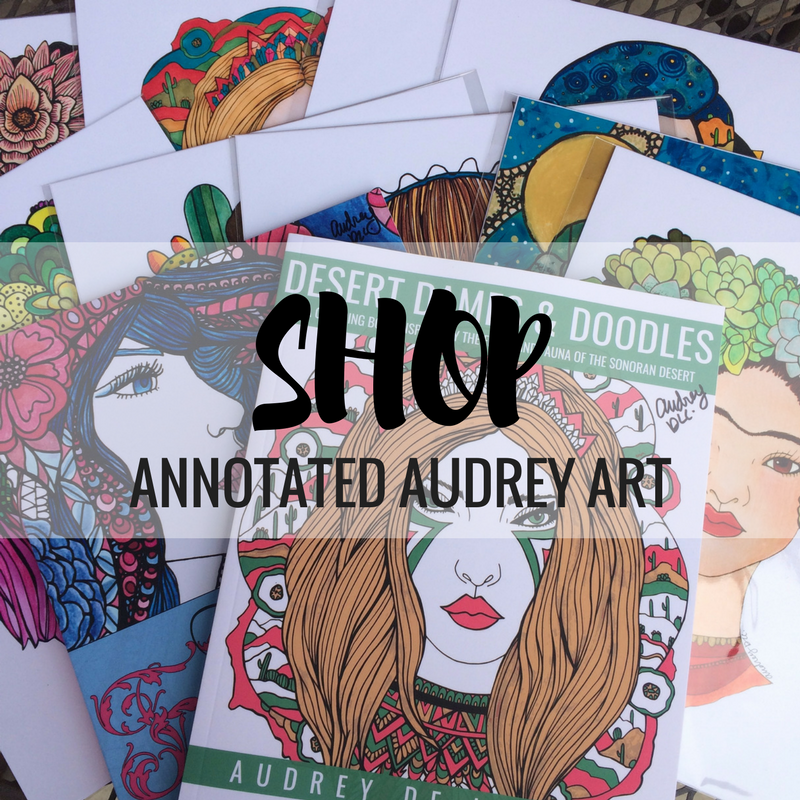 Annotated Audrey Art is a wife and husband team in Tucson, Arizona. We specialize in designing, printing and manufacturing desert and nature-themed products using our vibrant and quirky art. We believe that art has the power to spread positivity and that art should be accessible to everyone. Our mission is to make artful & affordable products that inspire people to have fun and bring color into their lives. Hello! My name is Audrey De La Cruz, and I am the artist and illustrator behind Annotated Audrey Art. Born and raised in Los Angeles, California, I moved to Tucson, Arizona in 2016 to pursue a full-time career as an artist. In my first year living in Tucson, I fell in love with its lush desert landscapes, strange creatures, and unique plant life. Unsurprisingly, my new surroundings quickly made their way into my art. Common themes in my work include desert scenes and cactus, as well as, female characters surrounded by desert flora. My trademark style combines rich colors, black outlines and bold patterns, which I often create using a variety of mediums and techniques ranging from ink and colored pencil to watercolor and acrylic paint. I strive to make art that people of all ages can enjoy because I firmly believe that art should be accessible and that anyone can be artistic as long as they find their creative spark. My name is Larry, I am the “Annotated” in Annotated Audrey. I was also born and raised in the Los Angeles area, but I went to school at The University of Arizona. While I was in school, I was able to experience the rich arts community of Tucson, AZ. This experience is what put Tucson on our radar as a place to live and pursue this new lifestyle. I use my graphic design skills to take Audrey’s art and turn it into all the different products that we sell. This includes adding the cute words and phrases that make everything, well, Annotated. I’m most comfortable working behind a computer, so my original art is in the form of vector graphics. Usually, these designs end up accompanied by a silly joke on a pin-back button. If you visit our booth at an event, I will typically be standing behind the table to greet you with a smile. I’d love to see you there! For business inquiries (wholesale purchasing, collaborations or commissions) please email audrey@annotatedaudrey.com. I’m always happy to see you making art! I know you breathe it!! A pleasure to meet you, especially this wonderful time of year. The pleasure is mine. I hope you had a wonderful holiday! I love your work! You are so talented =) I’m excited to see more of it!! I’m so glad you like my work. Hearing that really inspires me to keep on creating. ~ We share a broad, basic, general art style. I find inspiration in your work style that has opened up my own creativity. Don’t worry, we really are very different as well. I think it is the ‘flow’ and detail orientation we have. ~ I’m looking forward to knowing you better. I so like your style. Its so nice to meet you. I’m glad that you found me too. Trust me, you will fall in love with those colored pencils. They are amazing! Please feel to send me some of the results of your creative endeavors. I love seeing what other people are able to create with them. There are definite pros and cons to using an electric sharpener. Although they create a nice sharp tip and make your pencil last longer between sharpening, they do eat up your pencils. What I like to do is use the electric sharpener to give my pencils a good sharpening at first and then I use my Prismacolor colored pencil sharpener to sharpen the point as it dulls. Hope this helps! Hey Audrey! I just wanted to let you know that I have nominated you for the Liebster Award! To find out what the Liebster Award is all about, head to my post here at http://chloemayward.wordpress.com/2014/05/10/my-liebster-award-nomination/ Congratulations! Thank you so much Chloe, I’m honored! You’re very welcome 🙂 you’ve got a fantastic blog! I love this. Love your name and I love your art. The gif work is something I have been toying with, but not with my own creations. I like to experiment with taking things and doing them in different ways. Glad to find you. Thanks Ronovan! That’s so nice of you. Well done on being a self-taught artist following your passions. Keep up the work. Thanks for following. Looking forward to seeing more of you work. Thank you for following my blog 🙂 Great artworks you have here. I love your site and art! Thanks for following my blog. Are you incorporating anthropology into your artwork? I think they go wonderfully together. Thank you! And yes. Sometimes I do it intentionally, other times not so much. My fascination with human stories is ever present and it usually shows up in my creations. Awesome! I did find your work combining culture to be just wonderful. What does it mean when a comment is sent back? I wanted to comment in the first comment box that appeared, but it says my message was sent back. Anyway, you have a great talent and a real “BRAND” for the various social media you belong to. I appreciate your hard work. Wow! You’re an interesting girl I will enjoy reading. Thanks for following my blog. Wow. Thanks for your follow – this is truly one of the more moving ‘about’s I have read as a wordpress troller – looking forward to delving into your world more. Thanks! Dang guh, this stuff is amazing! You do sell some of your work, right? Audrey, your work is AMAZING. You have such a consistent and distinctive style. It’s really inspiring! you’d like to see featured there and let me know? Thanks! I love your work ! Keep it up ! Your art is incredibly beautiful, I look forward to seeing more of your work. Heya thank you for checking out my blog, I appreciate the follow 🙂 love the saying on your header, coffee gives me creativity! 😉 looking forward to your posts. Really interesting content Audrey. I’m enjoying looking through your site and getting to know you. Thanks for sharing your thoughts and art. It is inspiring. Anyway, your blog is awesome and I really like your art. Keep up the good work! Welcome, Audrey, lovely to meet you. Wow! I love your art work. (Stick figures are a challenge for me, and I mean that literally.) Thanks for following one of my blogs. I am so impressed by your ability to dedicate yourself to your art! We just moved to Arizona and it seems perfect that i feel so artsy inspired being here AND I found your blog! Thanks for the inspiration! We only moved here temporarily, but we are in Sierra Vista.